Wheel of Fortune Triple Action Frenzy slot machine from IGT slots is based on the legandary game show that was created by Merv Griffin and first seen on our TVs in 1975. This mobile slot has imagery from the show on its 5 reels, and there is a huge max jackpot of 10,000x. Not only is there a big jackpot but there are also 2 bonus features, one of which is the classic hangman game. We have a bonus for you, to play the game with a little more money, which you’ll find after the Wheel of Fortune Triple Action Frenzy slot review below. If you’re one of those people who has a history of shouting at the TV screen as another contestant fails to fill in the blanks on Wheel Of Fortune, now’s your chance to show them how it’s done, with the Wheel of Fortune Triple Action Frenzy slot. Based on the popular gameshow of the same name, the Wheel of Fortune Triple Action Frenzy slot machine gives players the chance to spin the iconic wheel and earn themselves some huge prizes, while also playing a regular five-reel, 15-payline slot that awards an incredible regular jackpot of 10,000x your stake. 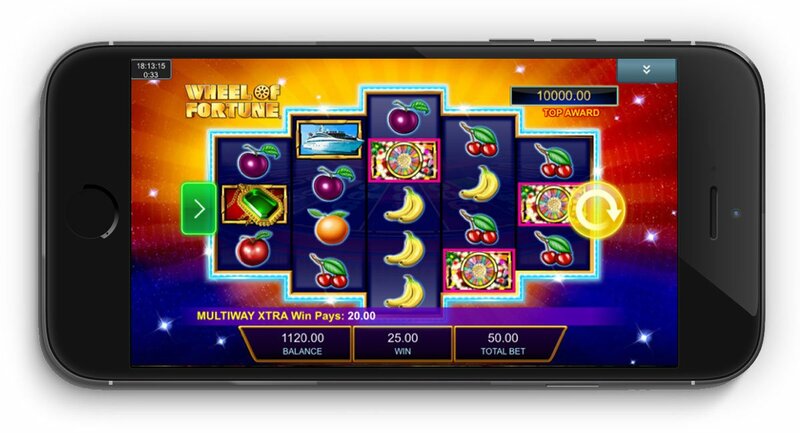 Featuring prize-inspired symbols including a cruise ship and island retreat and the cheesy muzak you’d expect from any gameshow worth its salt, Wheel of Fortune Triple Frenzy feels about as tacky as you can get – but don’t let that deter from the fact that it is an incredibly enjoyable mobile slot. The star attraction of the slot is the classic Wheel of Fortune hangman game, which is activated whenever three or more bonus symbols appear in any position on the game’s five reels. Once triggered, this feature whisks players away to a screen with three partially completed words, where they must then pick from the letter tiles below to fill in the blanks and increase their multiplier. Should they uncover a pointer icon – which will contain one, two or three colours that correspond to the three words in the hangman round – they’ll be transported to the wheel of fortune itself. Once the wheel is spun, the more blanks you filled in the previous round and the more colours you revealed on your pointer, the more prizes you can potentially win when it finally comes to a stop. In the main game, there is also a super wild symbol that only appears on the third reel. Once revealed, the super wild will unfold into a selection of five golden envelopes and all players have to do is pick one to reveal a 2x, 3x or even 5x multiplier that increases their winnings from the last spin. Whether you’re a fan of the gameshow or not, the Wheel of Fortune Triple Action Frenzy slot offers enough variety to keep players entertained – and regular jackpot is big enough to make it well worth a spin. Like the Wheel of Fortune Triple Action Frenzy slot review? Check out these as well…..